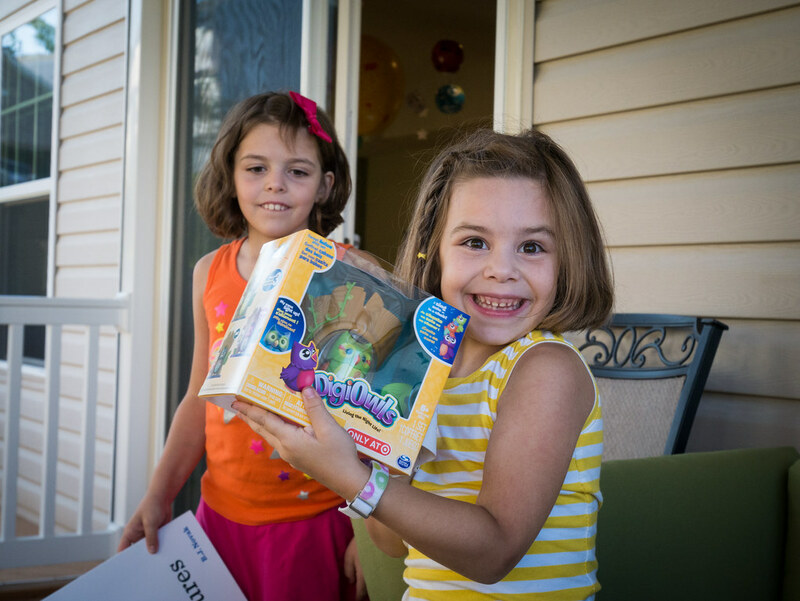 A 6th birthday that’s out of this world! 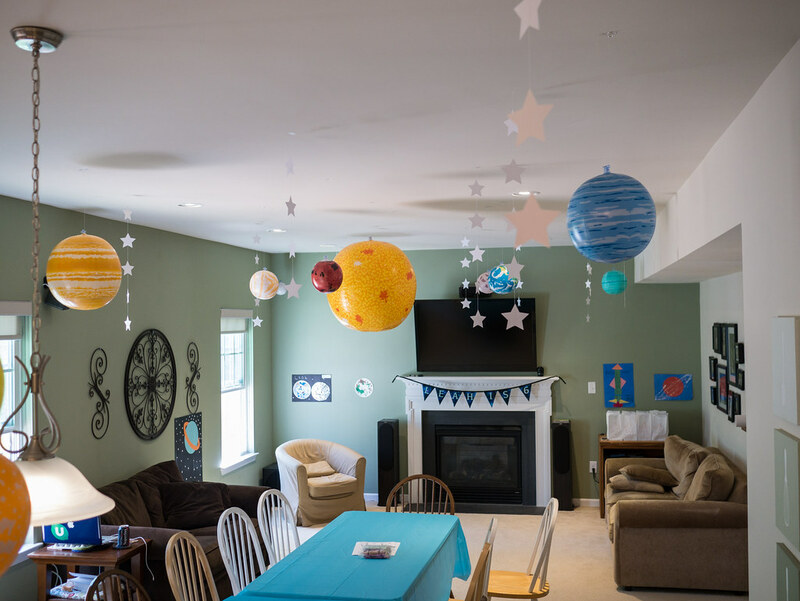 For many months, Leah was requesting a space themed birthday party. So, last weekend we made it happen. 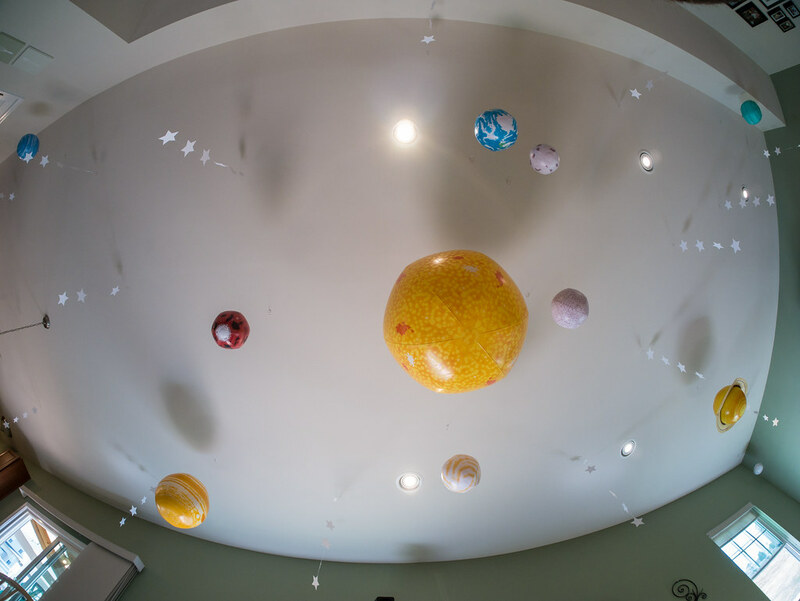 It was a very creative venture that led to some fun decorations, including an inflatable solar system and some sewn stars hanging from the ceiling. Chad did his best at arranging the solar system. Obviously not to scale as that wouldn’t work, but at least planetary distance should be in order of the planets. And yes, they included Pluto as well, which Leah banished to the corner. 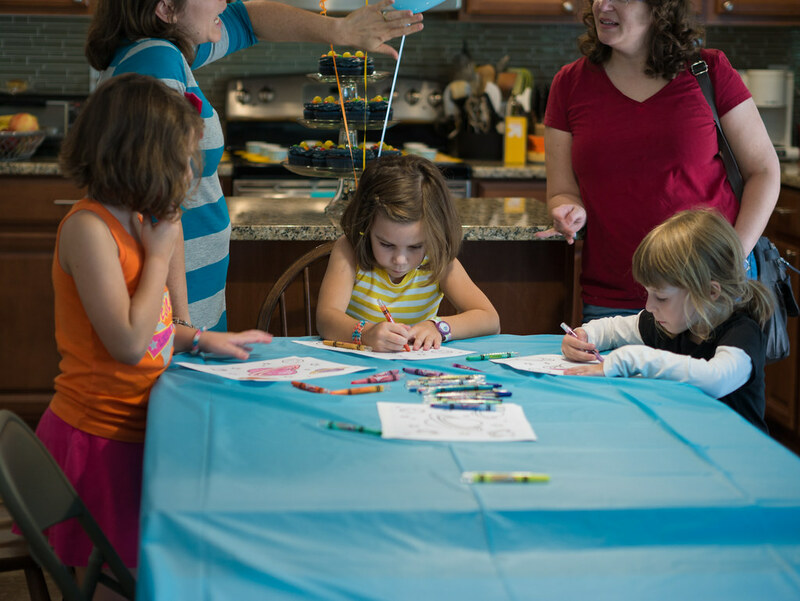 As the guests arrived for the party, there was some space coloring. 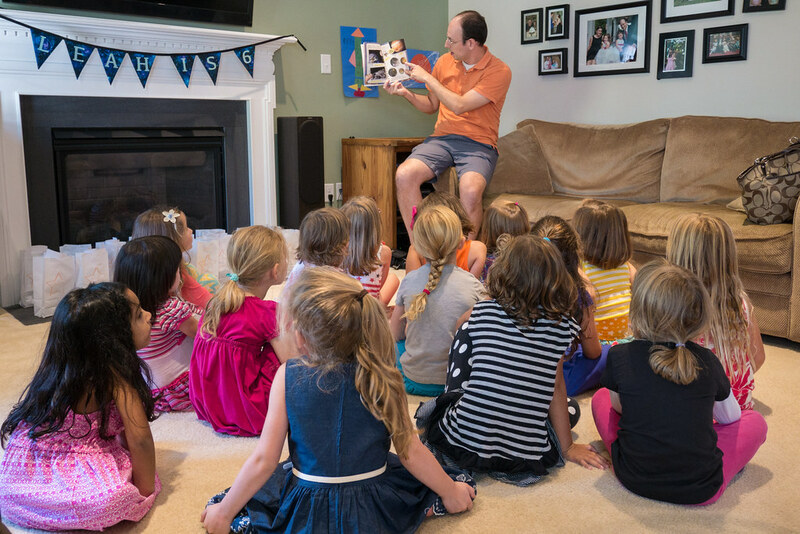 Chad then read the kids a book - Fly Guy Presents: Space. 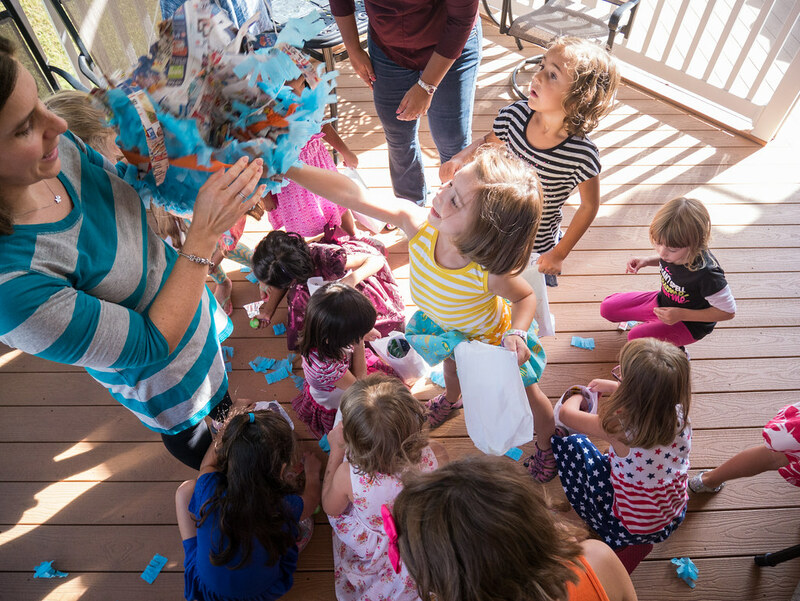 Next, all the kids donned disposable art smocks (made from trash bags) in order to paint the night sky. 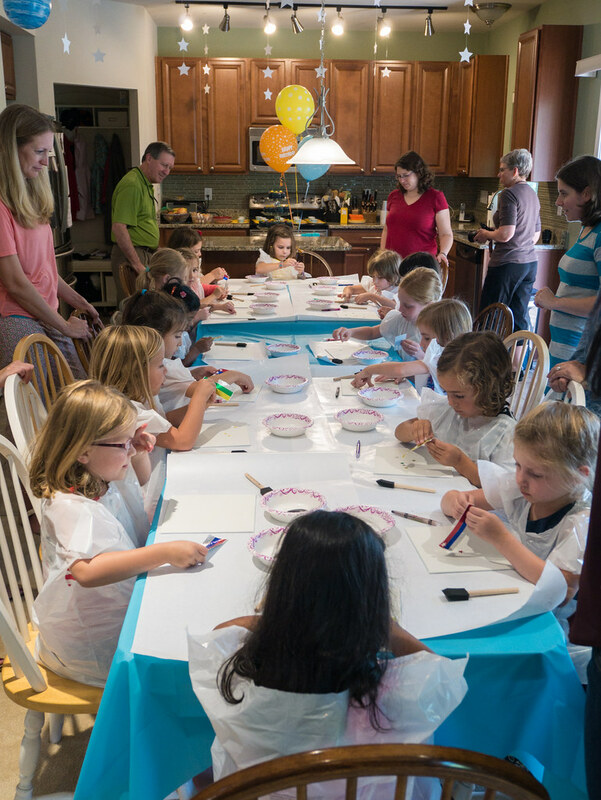 They were given canvases that I had pre-painted with glow-in-the-dark paint. Their first step was to stick stars onto their canvas in whatever constellation design they liked. 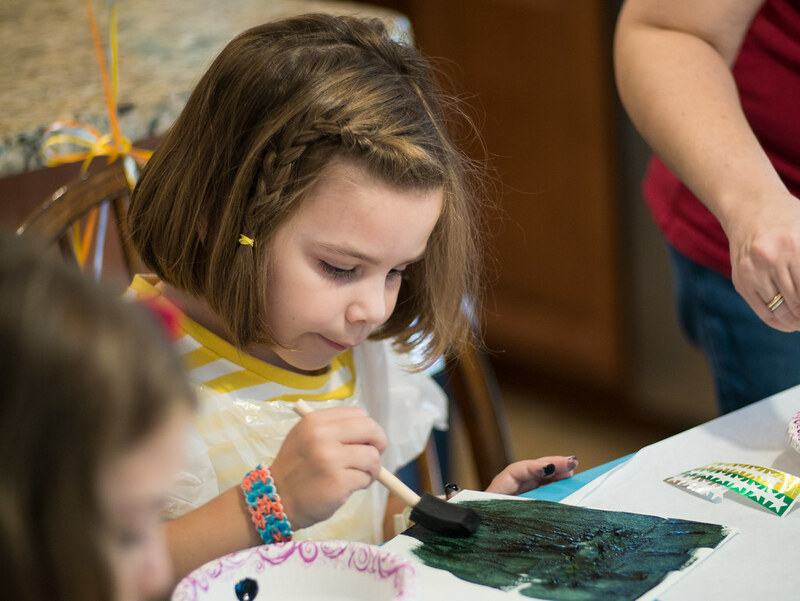 After sticking on stars, the girls painted the entire canvas black. Once dried, they removed the star stickers, giving them a black night sky with glow-in-the-dark stars. 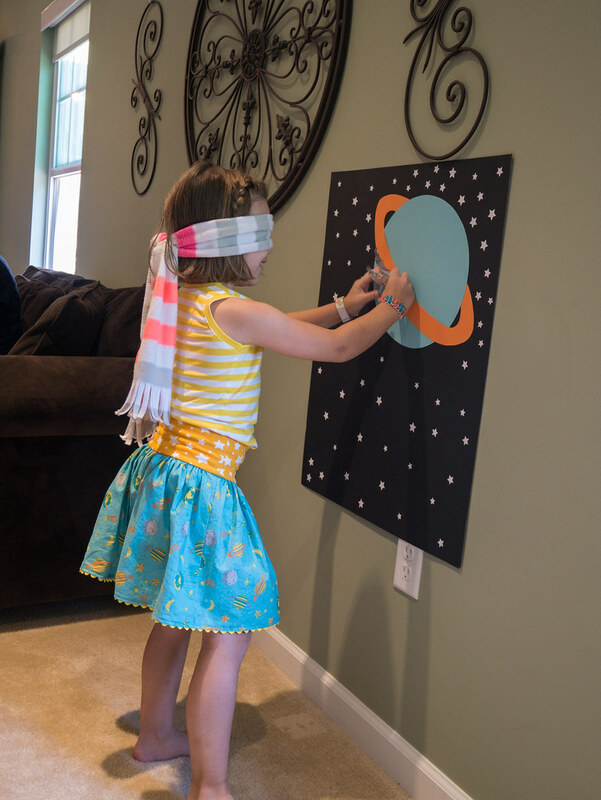 Next up was Pin the Rocket on Saturn. 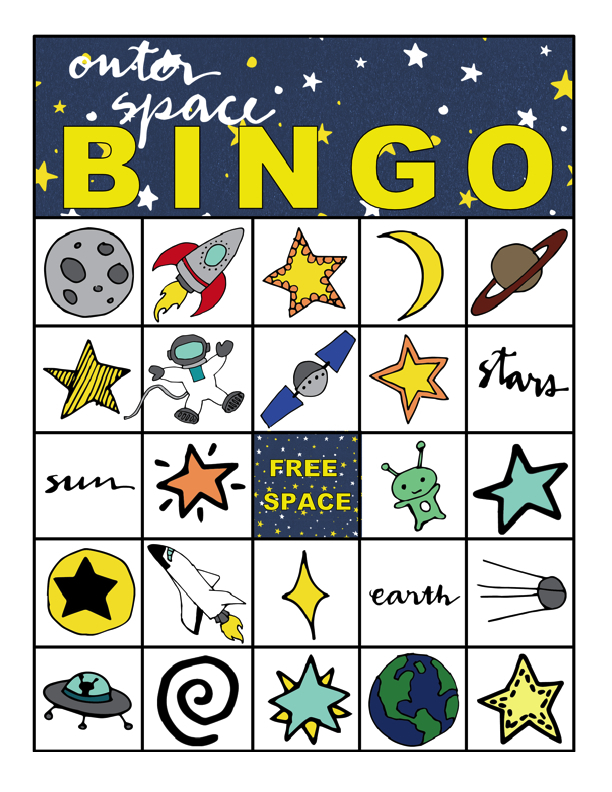 We moved on to Outer Space Bingo, created with clip art from LemonadePixel. Our snack included star-shaped cheese & crackers, rocket fruit kabobs, and Cheddar Rocket Crackers. (Sadly, no pictures of these. The cameraman must have had his hands full helping one of the 16 girls!) 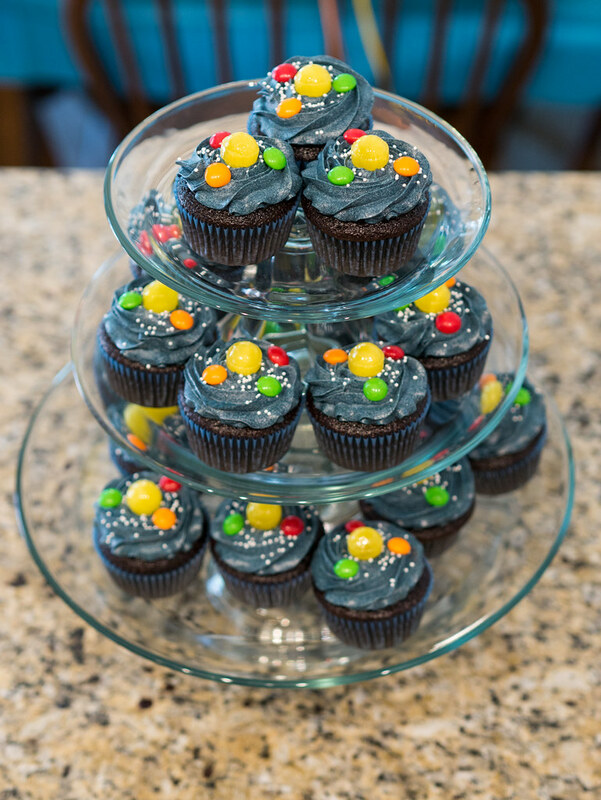 The outer space cupcakes with a lemon candy sun, Skittles planets, and sprinkle stars in the night sky were a hit! And no party is complete without singing to the birthday girl. 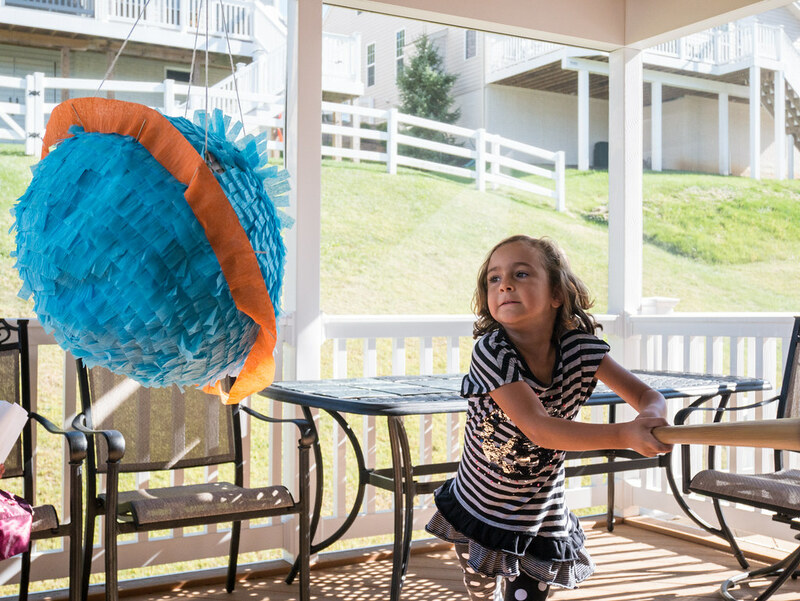 Then it was on to the piñata. 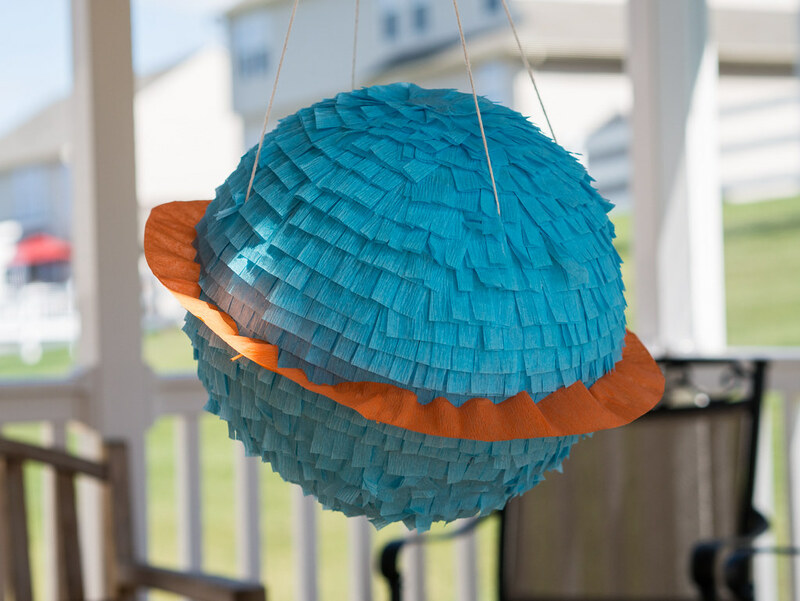 Leah is quick to tell you that her favorite planet is Saturn, so I made her a Saturn piñata. Some of the girls had a big swing. 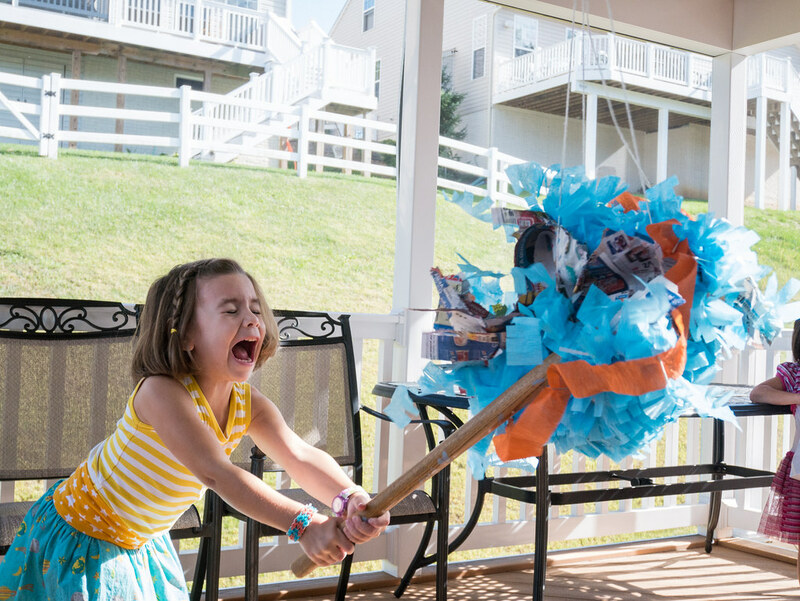 Leah put all her effort into breaking this piñata. It almost broke apart here, but managed to barely stay together for one more hit from Molly. Then there was of course the scramble for all the toys and candy. 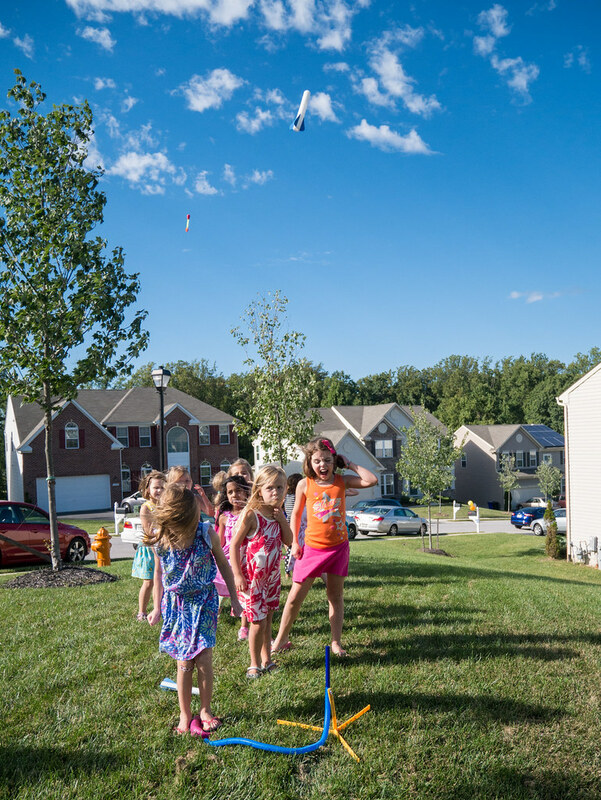 Last, we shot Stomp Rockets into the air. These were a big hit on a beautiful day. If you look closely, you can see both rockets in mid-air. We were way too busy to open presents at the party, but Leah was ready to do so as soon as it was over. She received lots of very fun presents. This year’s featured gift - DigiBirds. 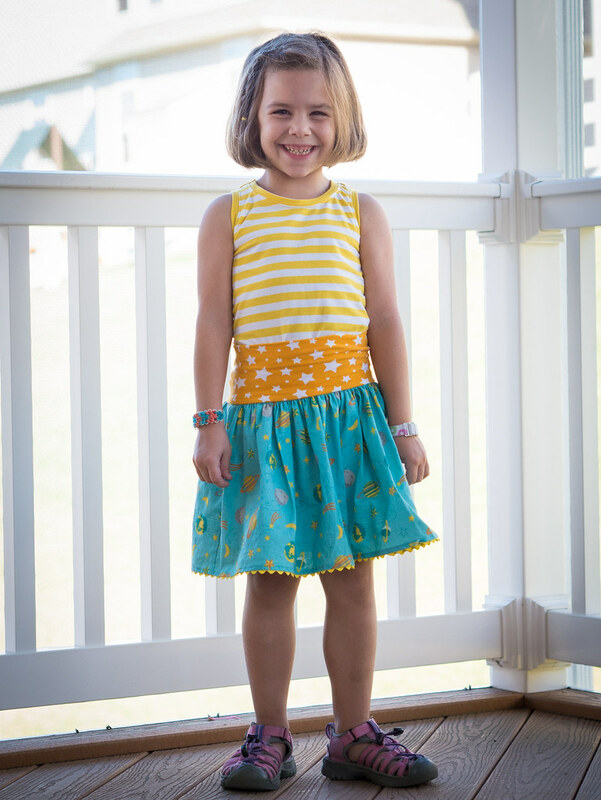 And if you didn't catch it in the pictures above, Leah was very excited that she was finally allowed to wear her solar system skirt (pattern by Little Lizard King), with a coordinating tank top in her favorite color! She and I collaborated on the birthday outfit (Mom was planning on a dress, but daughter insisted on separates, so we made it work!). Thanks to all who came to celebrate with Leah! We all had a blast! Believe it or not, Leah is now 6 years old (as of last week, sorry for the delay in writing this). Happy birthday Leah! Leah’s birthday came on a school day, so we saved the big party for the weekend. That didn’t stop these girls from having a happy birthday, though. Leah got to pick dinner and dessert. For dinner, she again picked Chick-Fil-A. 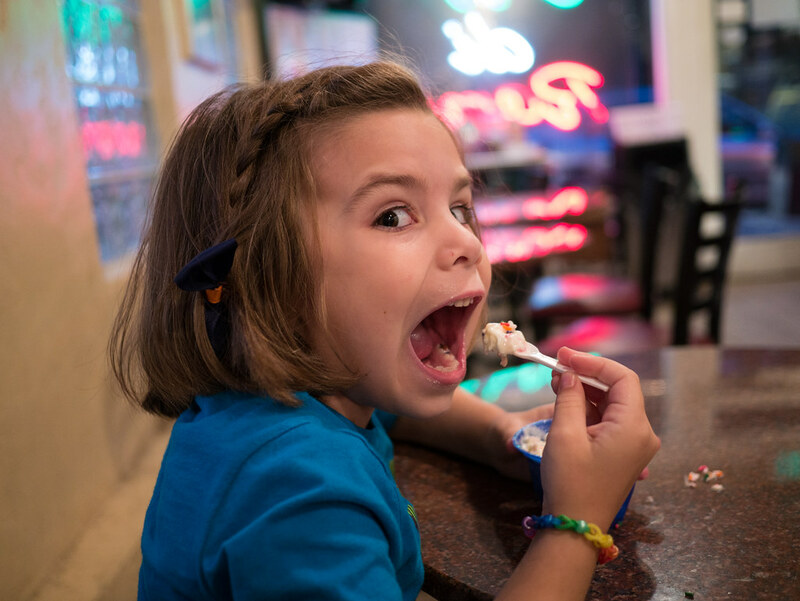 For dessert, she decided to forego traditional cake or cupcakes and instead picked some delicious gelato (don’t worry, the traditional dessert was coming a few days later). Her flavor of choice was of course birthday cake. Her birthday was only the beginning of the celebrating. The big fun was still to come. Whoo loves sewing? These two cuties do! 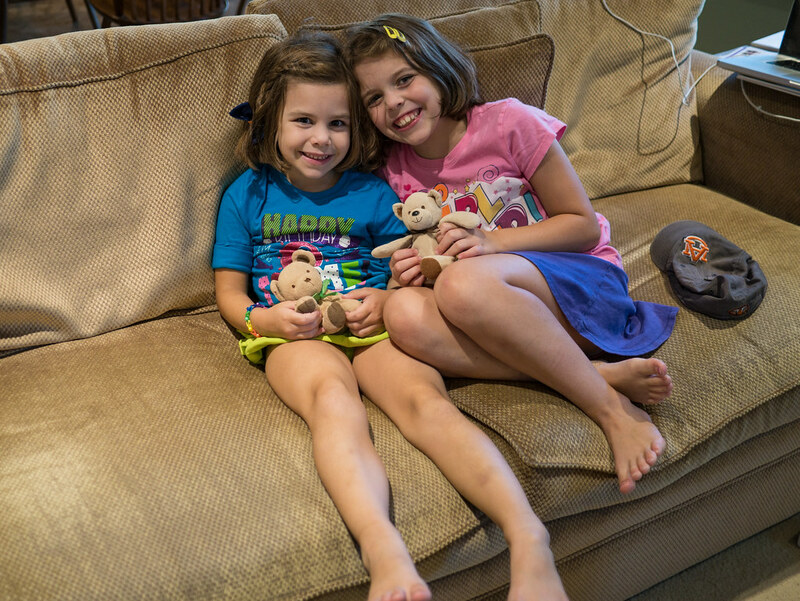 Our final sewing project for the summer was making an owl stuffed animal. 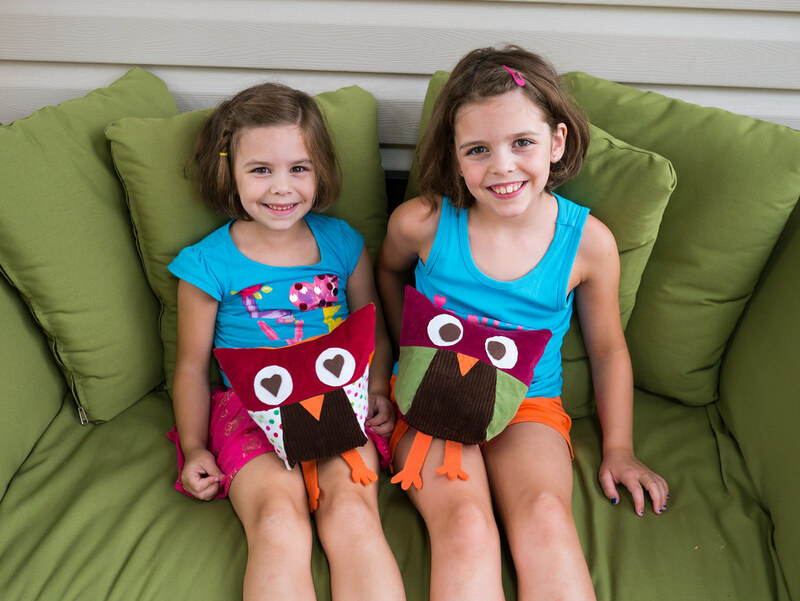 The girls enjoyed customizing their owls with their fabric choices and eye shapes. Mommy Sewing lessons were a great experience for all three of us. My hope is that it has inspired the girls and their creativity! 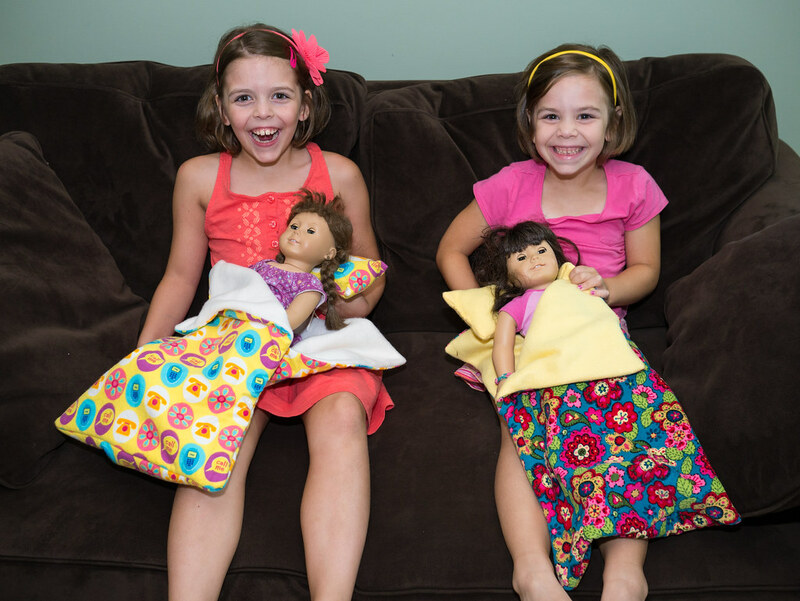 In this lesson, the girls created sleeping bags for their dolls. They were not satisfied with just the sleeping bag though, so requested to make pillows to match. I think all four girls were excited about this one! 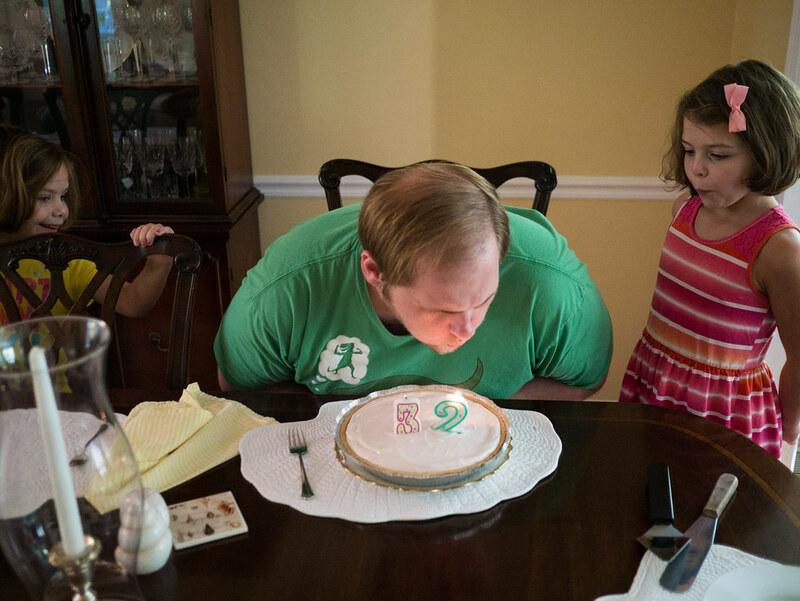 A couple of weeks ago, we gathered at Grams’s house to celebrate Uncle Scott’s birthday. I won’t tell you how old he is, but you might be able to guess. 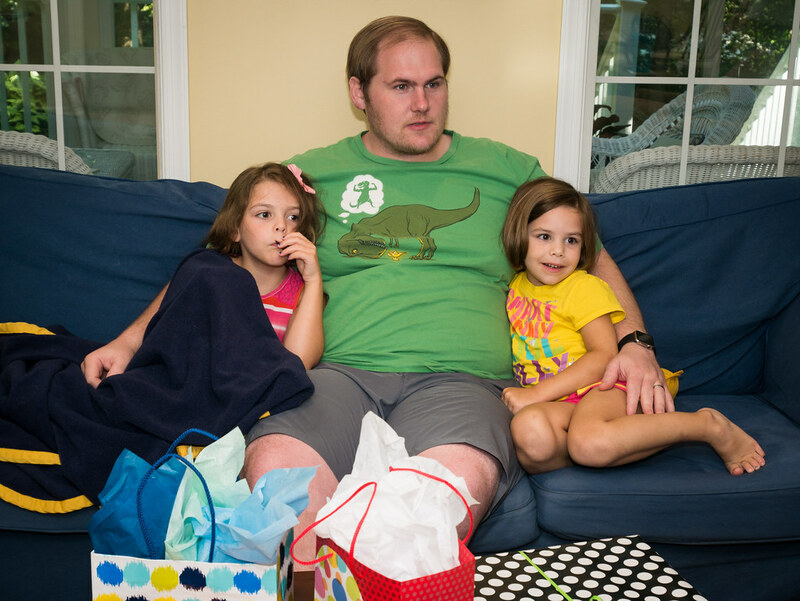 These girls love their Uncle Scott. 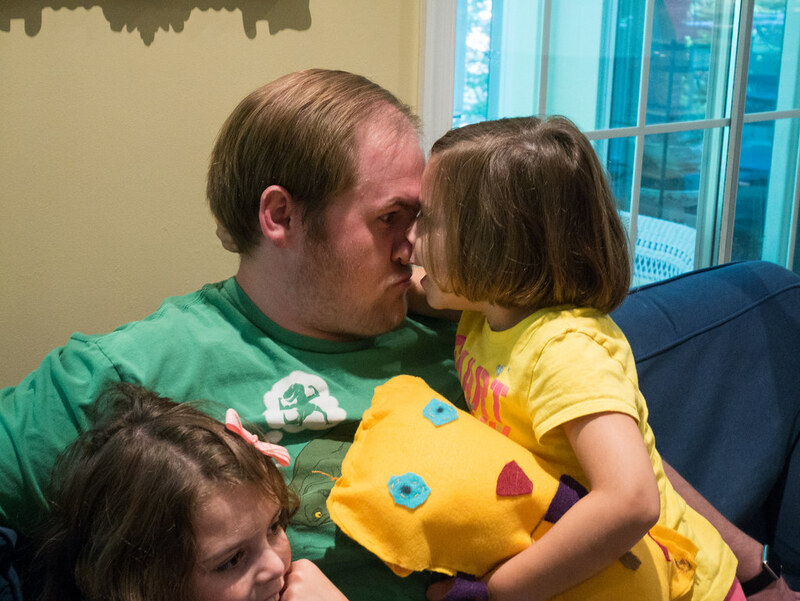 Leah still doesn’t quite grasp personal space. 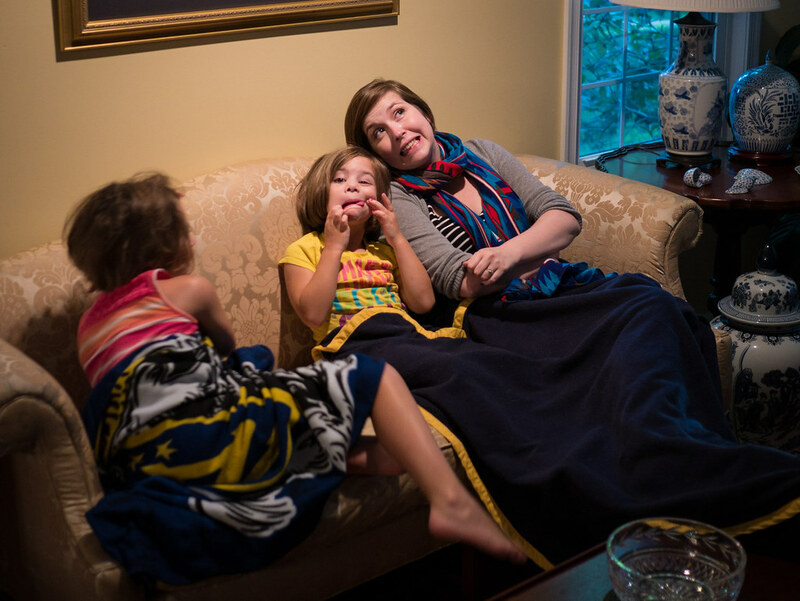 Leah’s got to get her sillies with Aunt Caroline while she can before Aunt Caroline moves to Chicago.